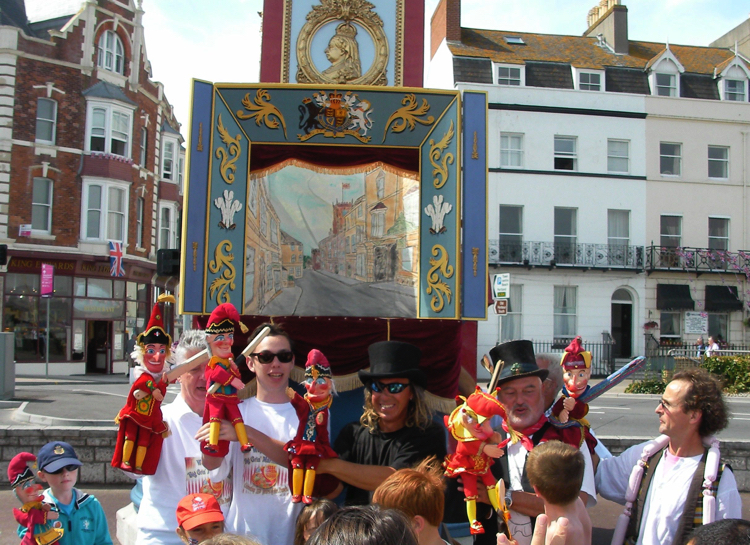 This ‘authentic’ Punch & Judy theatre is available for Television and Film work. 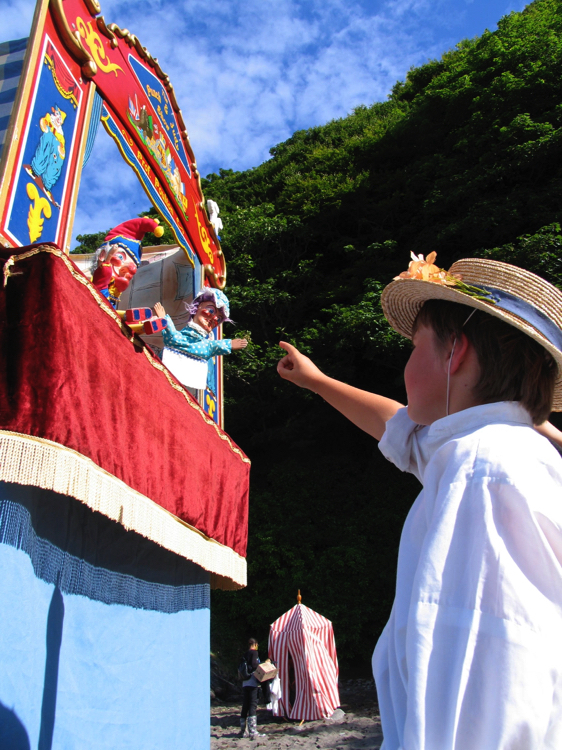 It is a workable theatre and has three different ‘guises’. Please contact me for more details. While on the train traveling home from Mr Punch’s 325th celebrations I noticed a picture in the book I was reading which really appealed to me. 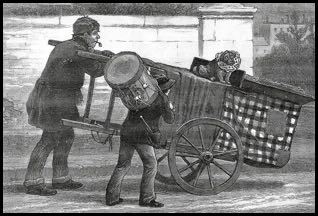 The pen & ink picture (dated 1890), shows a Punch man pushing a booth on a cart with a muzzled Dog Toby and a young lad walking along side the show with a drum on his back. 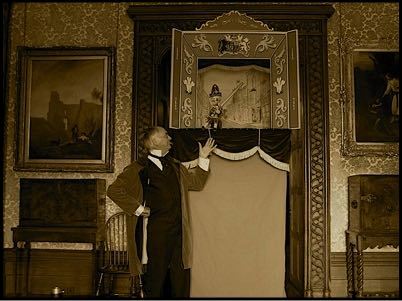 A few years later I started to think about making a replica of a ‘Victorian’ show and began the task of researching the subject. I have spent many many hours going through museum and library archives looking for pictures and references. I also contacted colleagues about the subject, who were all very helpful and interested in my project. 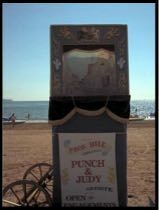 One picture I did uncover was of the 1921 Punch & Judy gathering, not Victorian but a very interesting find! With as much information, descriptions, prints and sketches as I could find I got work designing the booth (as I think it would have been but able to be dismantled to lay flat). For the main framework I used 2x2 timber and the education started! The original picture shows the bottom of the booth has no ‘cross’ supports, so this how I built the lower end. The ‘Top’ end of the booth is made using thin stripes of timber. (The proscenium and playboard is then bolted on). 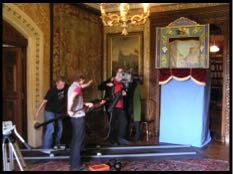 When I bolted it all together the whole booth swayed and was very unstable, so I added ‘cross supports on the two sides. This made the booth a little more stable but still not right, so I added them all round and that did the trick. 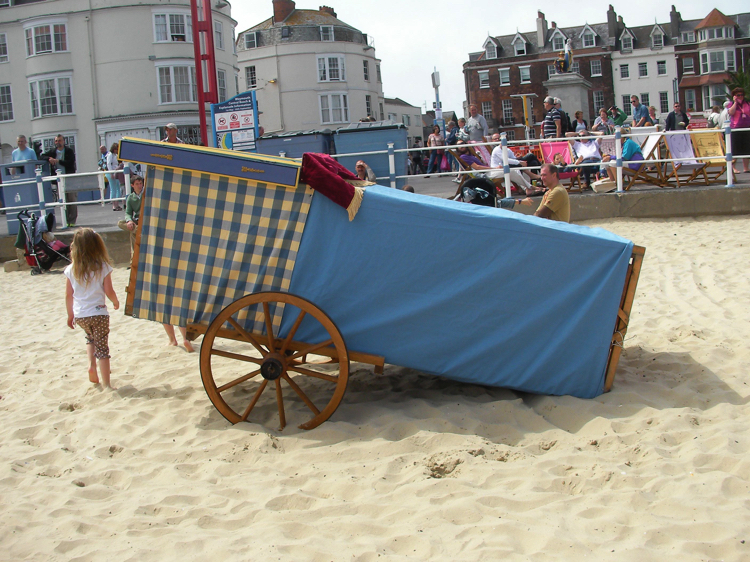 The ‘Footboard’ fitted in exactly and with my own weight on top it was very sturdy. 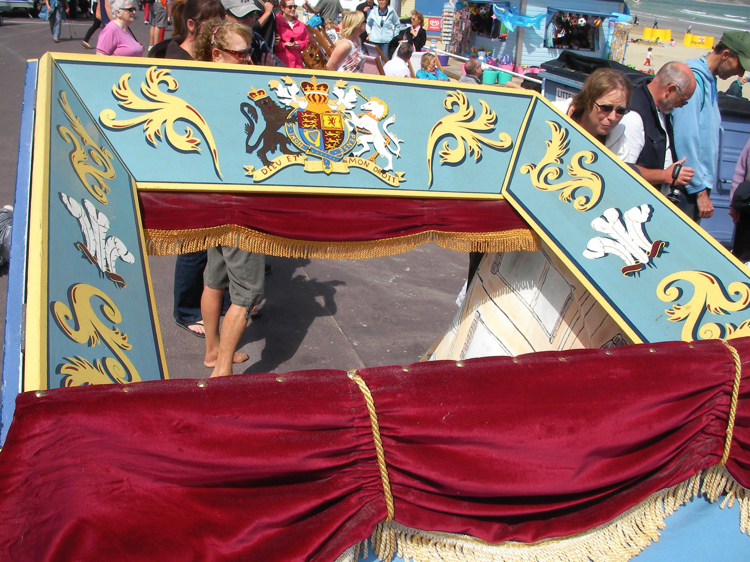 The proscenium was a real challenge, as looking at the original picture it appeared that the sides and top were all angled outwards, thus creating a basic amplifier! I got all the info together and found an old cup and saucer with a coat of arms on it which I copied onto the centre of the top panel. I then used a scrollwork design that was used on a royal charter from the time. The side of the proscenium have more scrollwork with the Prince of Wales feathers in the middle. Once I got design on to the wood I painted it using authentic ‘Victorian’ colors from the Farrow & Ball archive paint range. 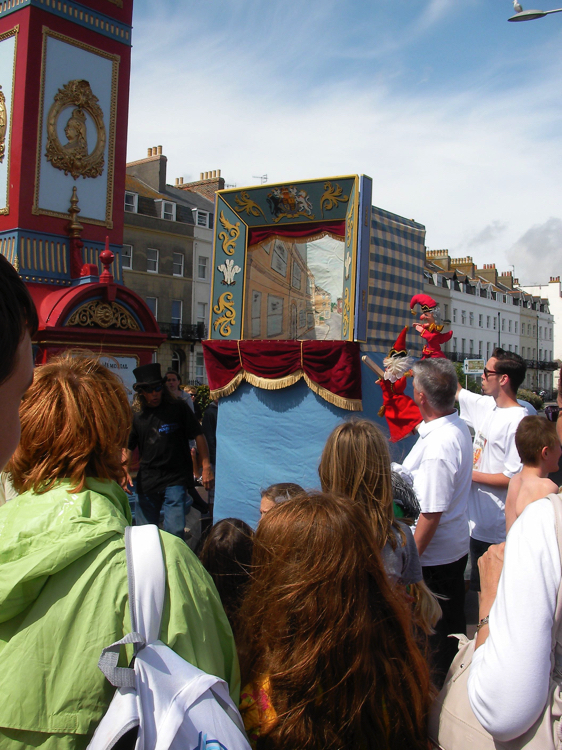 The backdrop for the booth is a local street scene from here in Paignton. For the coverings I had some blue canvas made up for the lower section and then spent ages trying to find some blue & white cheques for the top. Eventually I found some and the sewing commenced! 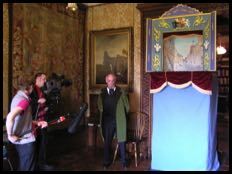 The banner was designed using the ‘Staddons’ of Weston-Super-Mare’s booth as the inspiration. 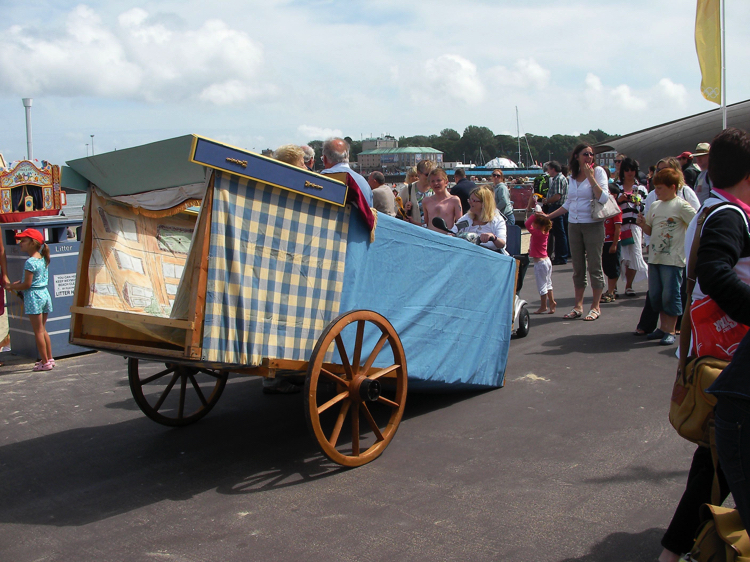 Now, while all of this was going on I was having some ‘wooden wheels’ made for the cart. After finally locating a ‘wheel-wright’ and showing him the original picture, he set to work making the wheels. (They are made from Ash, Beech and Oak, for those of you interested). 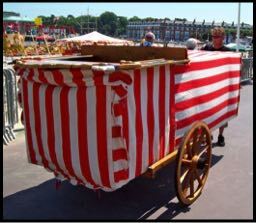 It was not until June when the wheels were finished and I started work on the cart, luckily, that only took a couple of days. I set the booth up in the back garden and put the finishing touches together and had a few rehearsals (switching from ‘hands in front of face’ to ‘hands above head’ was strange to get used to again). 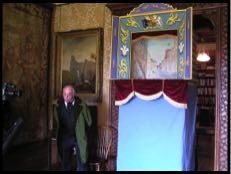 Over night I left the booth on cart and the next morning, through the post came a picture of Professor Smith’s (Ilfracombe) show sat on a cart. 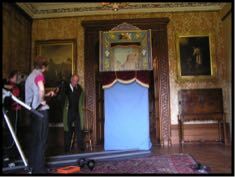 To my amazement the whole booth seems to be made very very similar to the one I have constructed. There were other things on the booth I’ve added, such as, many pictures taken from behind or from the side of the booth show a slope of the roof to the top of the proscenium (presumably for three reasons. The first being when it rains the water falls behind the booth, instead of in it. The second being for routines such as balancing acts, where there needs to be slightly more height. Thirdly, to increase the amplification (especially together with the angled proscenium). bolted it all together (which took about an hour), wheeled it around to the slipway and thought, now are the wheels going to sink into the sand? 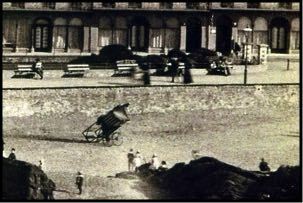 No, the whole show was well balanced on the cart and seemed to glide across the beach. 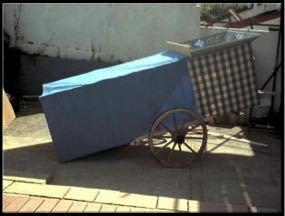 The cart also added as a support, pushed up against the side of the booth, the wind couldn’t push it over. The first performance I gave in it, I was very nervous and the booth had a very strange feel to it but one I hope to grow accustomed to. What I can tell you now, those old showman who pushed the show about, must have been very strong! There is quite a knack to it and it’s very hard work! Think of Frank Edmonds. 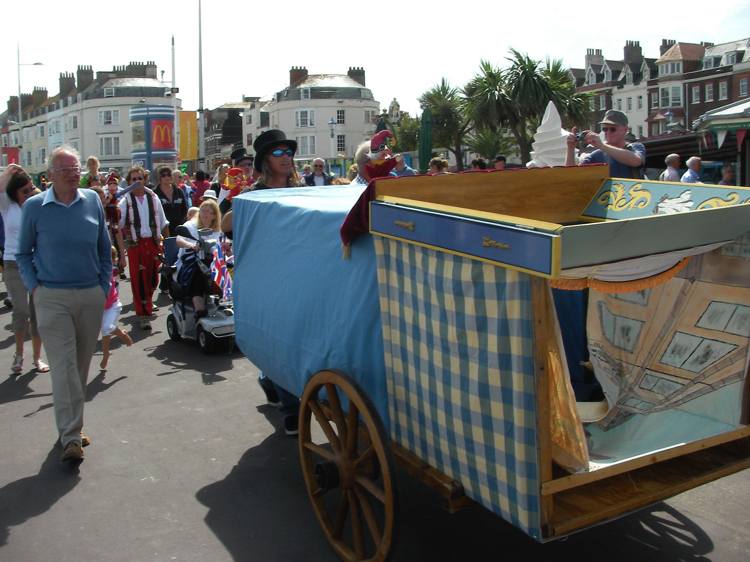 He pushed his show on a cart from Chester to Weymouth! You will notice the name on the banner is ‘Professor Hill’. 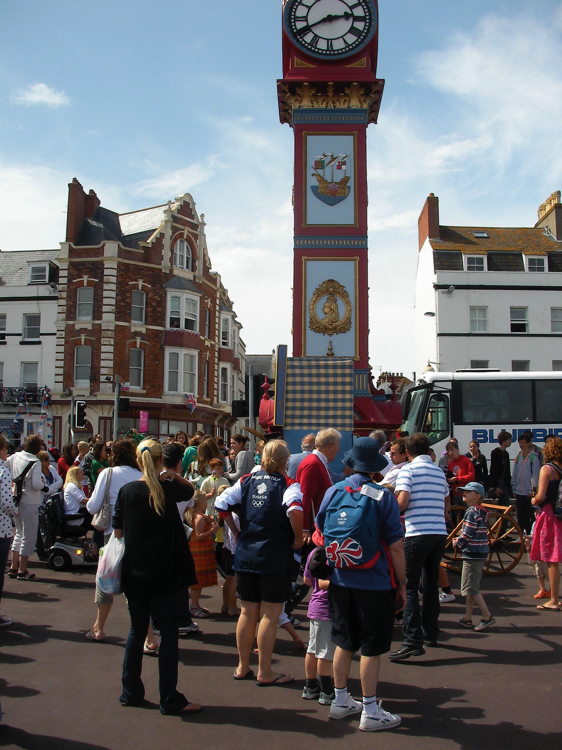 Professor Hill was the showman here in Paignton during the Edwardian period. The reason I am using a different name is that as the performance itself will be very different from the show I am well known for and I don’t want the two mixed up!